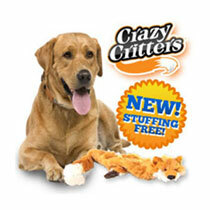 Crazy Critters are the stuffing free flat plush toy that your dog will love. They are strong, durable and realistic looking. Plus they have squeakers on both end, making your dog think that he or she is playing with a friend. Since Crazy Critters are stuffing-free, they lie flat, making them easy for practically any dog to play with. And, because they are stuffing-free, you will never have to worry about cleaning up the mess from a torn or ripped stuffed animal. Also, your dog will never be exposed to loose stuffing that can be dangerous if eaten. Crazy Critters are also machine washable so your dog can play with them indoors or outside, over and over again. They are great for dogs of all sizes. You can order the Crazy Critter Fox for just $10 plus shipping and handling. As a special bonus, you’ll also get the Crazy Critters Raccoon for free. You just have to pay the additional shipping.